Dr Alice Grady is a behavioural scientist and postdoctoral research fellow with the University of Newcastle. Her research aims to prevent chronic disease by putting robust evidence into practice within healthcare and community settings, such as schools, childcare services and more. To do this, Alice’s research draws on the benefits of digital health interventions—such as smart phone apps—that allow evidence to be translated in a way that is easily understood by the public and can be upscaled to reach more people. Alice completed a Bachelor of Psychology in 2009 and a PhD in behavioural science in 2016. Her PhD research examined barriers to the implementation of best-practice stroke care in Australia. During her candidature, Alice worked as a research assistant at the Priority Research Centre for Health Behaviour, under the supervision of Laureate Professor Rob Sanson-Fisher, before moving into the role of postdoctoral research fellow with the Hunter New England Population Health Research Group. Alice has broad experience in individual patient and applied health services research. Her current research is more niche, focusing on implementing and evaluating interventions to improve child nutrition. This includes leading a system-level randomised controlled trial examining the effectiveness of a web-based intervention to help over 50 childcare services across NSW adhere to dietary guidelines. 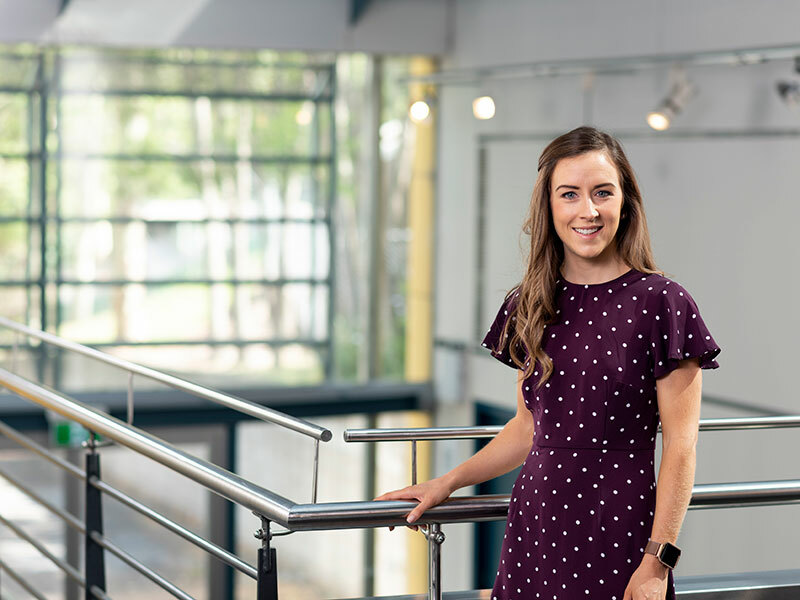 She was also recently awarded a Hunter Children's Research Foundation grant for a pilot trial assessing the potential impact of an online intervention to improve child dietary intake in childcare. Alice is a Public Health Early Career Researcher representative for Hunter Medical Research Institute Early and Mid-Career Researcher Steering Committee, and Hunter Cancer Research Alliance Symposium Committee representative for implementation science. She is also a member of multiple national and international societies, including the Australasian Society for Behavioural Health and Medicine, and International Society of Behavioural Nutrition and Physical Activity. © The Author(s) 2018. Purpose: To assess the effectiveness of an intervention including training, provision of written menu feedback, and printed resources on increasing childcare compliance with nutrition guidelines. Design: Parallel group randomized controlled trial. Setting: Hunter New England region, New South Wales, Australia. Participants: Forty-four childcare centers that prepare and provide food on-site to children while in care. Intervention: The intervention was designed using the Theoretical Domains Framework, targeted managers, and cooks and included implementation strategies that addressed identified barriers. Measures: Outcomes included the proportion of menus providing food servings (per child) compliant with overall nutrition guideline recommendations and each individual food group assessed via menu assessments. Cook knowledge of recommendations, intervention acceptability, adverse events, and barriers were also assessed via questionnaires with cooks and managers. Analysis: Logistic regression models, adjusted for baseline values of the outcome. Results: At baseline and follow-up, zero centers in the intervention and control groups were compliant with the overall menu guidelines or for the vegetable and meat food groups. Follow-up between-group differences in compliance for discretionary (33.3 vs 5, P =.18), dairy (41.7 vs 15, P =.16), breads and cereals (8.3 vs 10 P = 1.00), and fruit (16.7 vs 10, P =.48) were all nonsignificant. Relative to the control group, intervention centers showed a significantly greater increase in percentage of cooks with correct knowledge for vegetable servings (93.3 vs 36.4, P =.008). Conclusion: Although the application of the theoretical framework produced a broader understanding of the determinants of menu compliance, due to the complexity of guidelines, limited follow-up support, lower training uptake, and low intervention dose, the intervention was not effective in supporting the practice change required. © 2018 Australian Health Promotion Association Issue addressed: Online systems offer opportunities to provide effective, ongoing support to childcare services to implement dietary guidelines. The study aimed to assess the effectiveness of a dissemination strategy on childcare service: (i) adoption; and (ii) use of an online menu planning program designed to increase compliance with dietary guidelines. Methods: A nonrandomised controlled trial was conducted with long day care services across Australia. All services received an email invitation to access an online evidence-based menu planning program. Services in the intervention also received training, telephone contact and provision of a portable computer tablet to encourage program adoption and use. Outcomes were assessed at the 6-month follow-up using analytics data recorded by the online program. Outcomes included the proportion of services having accessed the program (adoption) and the proportion of services with a current menu entered in the program (use as intended). Results: Twenty-seven interventions and 19 control services took part. At the 6-month follow-up, 100% vs 58% of services had adopted the online menu planning program (OR: 14.67, 95% CI: 2.43-infinity; P¿<¿0.01) and 41% vs 5% of services had a current menu entered in the program (OR: 9.99, 95% CI: 1.01-534.57; P¿<¿0.01) in the intervention and control arms respectively. Conclusions: This study highlights the need for strategies to support adoption and use of an online menu planning program in childcare services if the potential benefits of such a program are to be achieved. Future research should explore the effectiveness of differing strategies to increase adoption and use of online programs at scale. So what? : Strategies to support childcare service uptake and use of online programs are required in order for the potential public health benefits of such technologies to be realised. © 2018 Australian Health Promotion Association Issue addressed: Improving implementation of school healthy canteen policies requires a comprehensive understanding of implementation barriers. Therefore, the aim of this study was to assess a range of barriers, as reported by canteen managers, using a quantitative survey instrument developed based on a theoretical framework. Methods: A cross sectional survey of primary school canteen managers from the Hunter New England region of New South Wales was conducted of eligible schools in the study region identified as having an operational canteen. Survey items assessed canteen manager employment status, canteen characteristics and potential barriers to healthy canteen policy implementation, aligned to the 14 domains of the theoretical domains framework via a 5-point Likert scale ranging from 1 (strongly disagree) to 5 (strongly agree). The mean domain scores of canteen managers were calculated, less than four indicating the canteen manager considered the domain was a barrier. Canteen managers were also asked to provide the current canteen menu for audit by a dietitian. Results: Of the 184 participants, 20% (n¿=¿36) were assessed as having menus compliant with the state policy. The five most common domains identified as potential barriers to policy implementation were behavioural regulation (n¿=¿117, 65%), skills (n¿=¿105, 57%), beliefs about capabilities (n¿=¿100, 55%), reinforcement (n¿=¿95, 52%) and goals (n¿=¿95, 52%). Canteen managers who reported optimism as a barrier had significantly lower odds of having a menu compliant with the state policy (OR¿=¿0.39; 95% CI 0.16-0.95, P¿=¿0.038). Conclusions: This study provides further evidence of perceived and actual barriers that canteen managers face when attempting to implement a healthy canteen policy, and highlights the need to address differences in canteen characteristics when planning implementation support. So what? : For public health benefits of nutrition policies within schools to be realised, the barriers to implementation need to be identified and used to help guide implementation support strategies. © 2016 Elsevier Ireland Ltd Objectives To examine the: 1) methodological quality of interventions examining strategies to improve patient-practitioner communication involving treatment decisions; 2) effectiveness of strategies to improve patient-practitioner communication involving treatment decisions; and 3) types of treatment decisions (emergency/non-emergency) in the included studies. Methods Medline, PsychINFO, CINAHL, and Embase were searched to identify intervention studies. To be included, studies were required to examine patient-practitioner communication related to decision making about treatment. Study methodological quality was assessed using Cochrane&apos;s Effective Practice and Organisation of Care risk of bias criteria. Study design, sample characteristics, intervention details, and outcomes were extracted. Results Eleven studies met the inclusion criteria. No studies were rated low risk on all nine risk of bias criteria. Two of the three interventions aimed at changing patient behaviour, two of the five practitioner directed, and one of the three patient-practitioner directed interventions demonstrated an effect on decision-making outcomes. No studies examined emergency treatment decisions. Conclusions Existing studies have a high risk of bias and are poorly reported. There is some evidence to suggest patient-directed interventions may be effective in improving decision-making outcomes. Practice implications It is imperative that an evidence-base is developed to inform clinical practice. © The Author 2015. Published by Oxford University Press. All rights reserved. Background. People with a history of stroke or heart disease are at increased risk of future stroke; therefore, identification of risk factors by GPs is critical. Objectives. To compare the following among general practice patients with and without a history of stroke or heart disease: (i) self-reported prevalence rates of lifestyle risk factors; (ii) accuracy of GP detection of patient-reported risk factors and (iii) average proportion of patient-reported risk factors detected by GPs. Methods. Consecutive patients attending a participating general practice clinic were invited to participate in a cross-sectional touchscreen survey assessing lifestyle risk factors in 2010-11. The GP of each consenting patient completed a corresponding survey assessing the patient&apos;s risk factors. Demographic characteristics of patients and GPs were obtained. Results. Data from 51 GPs and 564 patients were analysed. Patients without a history of stroke or heart disease reported significantly higher rates of smoking (12%) and risky alcohol consumption (56%) than patients with a history of stroke or heart disease (6% and 36%, respectively). Low sensitivity of GP detection of risk factors was found for all risk factors for all patients. Patients with a history of stroke or heart disease have a significantly higher mean proportion of risk factors detected by their GP compared to patients without a history of stroke or heart disease (P = 0.00). Conclusion. Given low sensitivity and specificity of GP detection of risk factors among patients, alternate methods of identification are needed. Research is required to determine strategies to facilitate secondary care of patients with a history of stroke or heart disease by GPs. © 2015 Grady et al. Background: Emergency department staff play a crucial role in the triage of stroke patients and therefore the capacity to deliver time-dependent treatments such as tissue Plasminogen Activator. This study aimed to identify among emergency physicians, (1) rates of agreement with evidence supporting tissue Plasminogen Activator use in acute stroke care; and (2) individual and hospital factors associated with high agreement with evidence supporting tissue Plasminogen Activator use. Methods: Australian fellows and trainees of the Australasian College for Emergency Medicine were invited to complete an online cross-sectional survey assessing perceptions of tissue Plasminogen Activator use in acute stroke. Demographic and hospital characteristics were also collected. Results: 429 Australasian College for Emergency Medicine members responded (13% response rate). Almost half (47.2%) did not agree with any statements regarding the benefits of tissue Plasminogen Activator use for acute stroke. Perceived routine administration of tissue Plasminogen Activator by the head of respondents&apos; emergency department was significantly associated with high agreement with the evidence supporting tissue Plasminogen Activator use in acute stroke. Conclusions: Agreement with evidence supporting tissue Plasminogen Activator use in acute stroke is not high among responding Australian emergency physicians. In order for tissue Plasminogen Activator treatment to become widely accepted and adopted in emergency settings, beliefs and attitudes towards treatment need to be in accordance with clinical practice guidelines. © The Author 2015. Published by Oxford University Press. All rights reserved. Background. Meta-analyses indicate 50% of cases of depression are not detected by GPs. It is important to examine patient and GP characteristics associated with misclassification so that systems can be improved to increase accurate detection and optimal management for groups at risk of depression. Objective. To examine patient and GP characteristics associated with GP misclassification of depression for patients classified by the Patient Health Questionnaire-9 as depressed. Methods. A cross-sectional study within general practices in two states of Australia. GPs completed a one-page paper and pencil survey indicating whether they thought each patient was clinically depressed. Patients completed a computer tablet survey while waiting for their appointment to provide demographic information and indicate depression status. Chi-square analyses were used to determine whether patient and GP characteristics were associated with a false-negative and false-positive result. The probability of misclassification was modelled using Generalized Estimating Equations to account for clustering of patients. Results. Fifty GPs from 12 practices participated. GPs completed surveys for 1880 patients. Younger patients aged 25-44, and those with a health care card were less likely to have a false-negative assessment. Patients with 0-3 GP visits in the past 12 months, and those with private health insurance were less likely to have a false-positive assessment. GPs who worked five sessions or fewer per week were more likely to make false-positive assessments. Background: Stroke is a leading cause of death and disability internationally. One of the three effective interventions in the acute phase of stroke care is thrombolytic therapy with tissue plasminogen activator (tPA), if given within 4.5 hours of onset to appropriate cases of ischaemic stroke.Objectives: To test the effectiveness of a multi-component multidisciplinary collaborative approach compared to usual care as a strategy for increasing thrombolysis rates for all stroke patients at intervention hospitals, while maintaining accepted benchmarks for low rates of intracranial haemorrhage and high rates of functional outcomes for both groups at three months.Methods and design: A cluster randomised controlled trial of 20 hospitals across 3 Australian states with 2 groups: multi- component multidisciplinary collaborative intervention as the experimental group and usual care as the control group. The intervention is based on behavioural theory and analysis of the steps, roles and barriers relating to rapid assessment for thrombolysis eligibility; it involves a comprehensive range of strategies addressing individual-level and system-level change at each site. The primary outcome is the difference in tPA rates between the two groups post-intervention. The secondary outcome is the proportion of tPA treated patients in both groups with good functional outcomes (modified Rankin Score (mRS <2) and the proportion with intracranial haemorrhage (mRS =2), compared to international benchmarks.Discussion: TIPS will trial a comprehensive, multi-component and multidisciplinary collaborative approach to improving thrombolysis rates at multiple sites. The trial has the potential to identify methods for optimal care which can be implemented for stroke patients during the acute phase. Study findings will include barriers and solutions to effective thrombolysis implementation and trial outcomes will be published whether significant or not.Trial registration: Australian New Zealand Clinical Trials Registry: ACTRN12613000939796. © 2014 Paul et al. ; licensee BioMed Central Ltd.
© 2014 Grady et al. Objective: To assess emergency physicians&apos; perceptions of individual and system enablers to the use of tissue Plasminogen Activator in acute stroke.Method: Australian fellows and trainees of Australasian College for Emergency Medicine completed a 57-item online survey assessing enablers to implementation of evidence-based practice across six domains: knowledge, skills, modelling, monitoring, feedback, and maintenance. Demographic and workplace characteristics were obtained. Descriptive statistics were calculated to describe demographic and workplace characteristics of responders, and survey responses. Each domain received an overall score (%) based on the number of responders agreeing with all items within the domain.Results: A total of 429 (13%) Australasian College for Emergency Medicine members responded. 17.7% of respondents reported they and/or their workplace met all knowledge-related enablers, however only 2.3% had all skill-related enablers in place. Of respondents who decide which patients receive tissue Plasminogen Activator treatment, 18.1% agreed that all maintenance-related enablers are in place at their hospital, compared to 6.6% for those who do not decide which patients receive tissue Plasminogen Activator treatment. None of the respondents had all items in place cross all domains.Conclusions: Even when allowing for the low response rate, it seems likely there is a lack of individual and system enablers supporting the implementation of bestpractice stroke care in a number of Australian hospitals. Quality improvement programs could target all domains, particularly the skills-training and feedback emergency physicians receive, to aid implementation of tissue Plasminogen Activator treatment for acute stroke. Objective: The study explored (1) the level of awareness, and associates of greater awareness, of the appropriate action to take in response to stroke symptoms; and (2) actions taken in response to potential stroke symptoms, among general practice patients. Methods: Patients attending general practice clinics in New South Wales, Australia completed a paper and pencil survey. Results: 308 participants returned the survey. 76% indicated they would call an ambulance within 10. min for &apos;difficulty speaking or understanding others, with blurred vision (in one eye), and face, arm or leg weakness or numbness (on one side of the body)&apos;. Having a first degree relative with a history of stroke was significantly associated with greater awareness of the appropriate action to take in response to stroke symptoms. Of those reporting they had experienced &apos;dizziness, loss of balance or an unexplained fall&apos; 80% did not call an ambulance at the time of experiencing this symptom. Conclusion: There appears to be high awareness of the appropriate response to take for stroke symptoms among this sample, however this does not translate into actions when individuals experience a potential stroke symptom. Practice implications: Education campaigns should be targeted towards individuals without a family history of stroke. © 2014 Elsevier Ireland Ltd.